1992 3 10. The Village Voice. "Mark DeGarmo: Travelers"
1993 6 7. New York Times. "Mark DeGarmo: My Father is a Tree"
1994 10. Birmingham News. 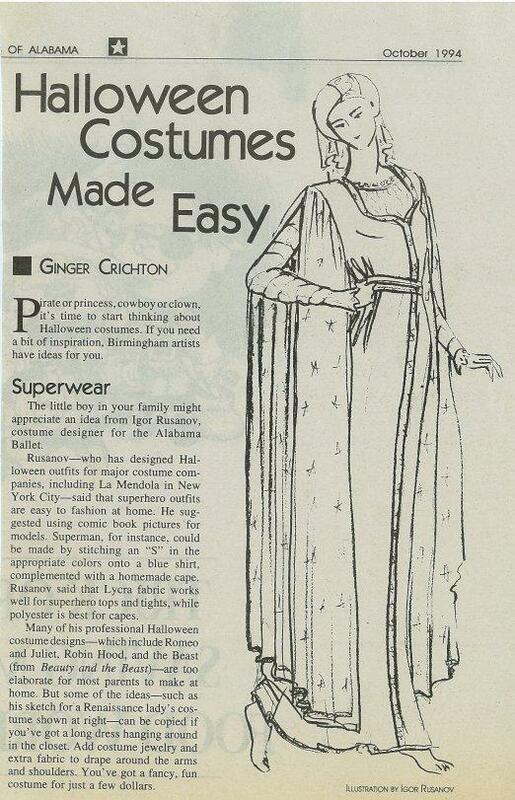 "Halloween Costuming Made Easy"
1995 2 26. Birmingham News. 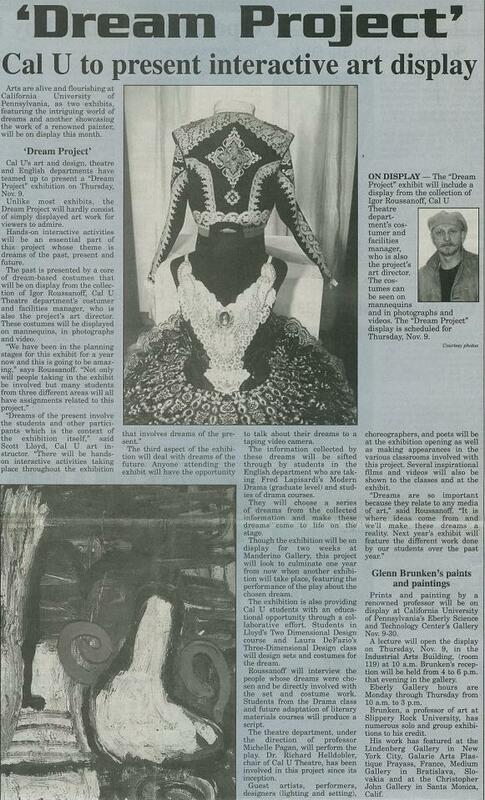 "On the street or on the stage Roussanoff designs pure fantasy"
1995 10 21. 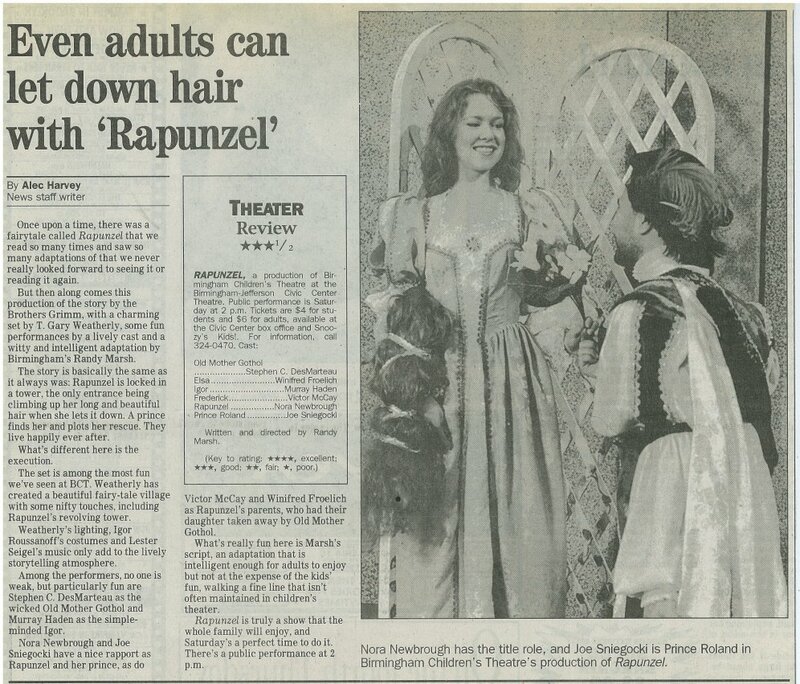 "Even adults can let down hair with 'Rapunzel'"
1996 Sunday 26. Chattanooga Free Press. 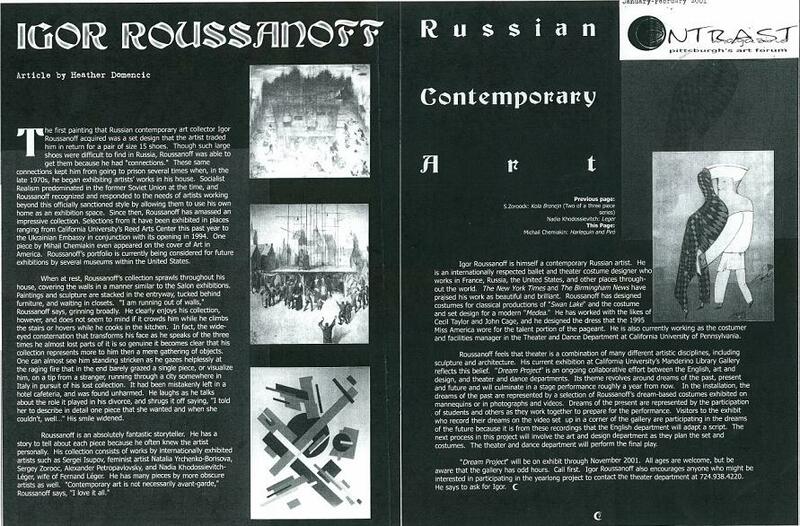 "Contemporary Russian Art"
1996. Birmingham News. 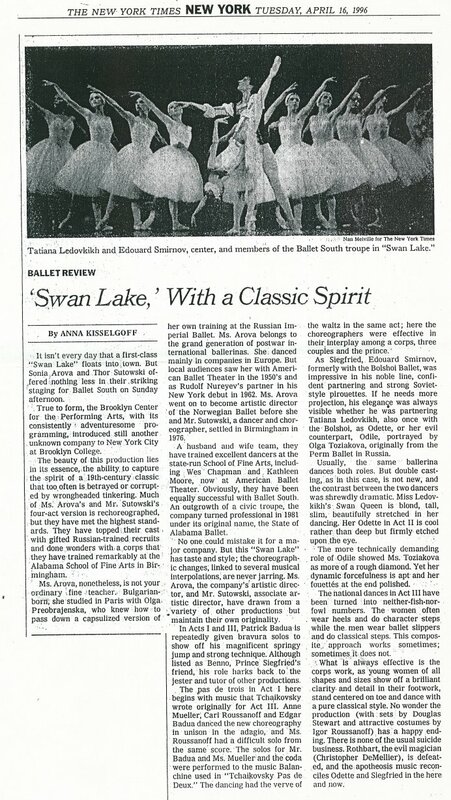 "Swans live in high-flying ballet presentation"
1996. Improv Magazine, Birmingham. "Kiev Trip"
1997 8. Birmingham Entertainment Guide. 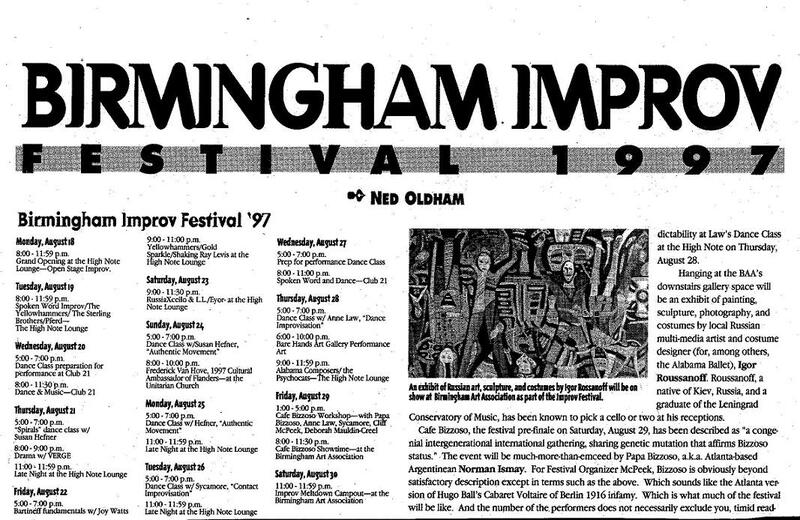 "1997 Improv Festival"
1997 8 31. Birmingham News. 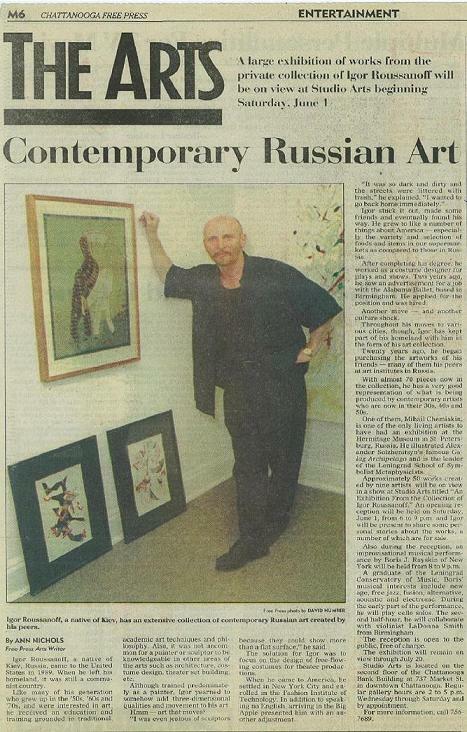 "Russian Art Triumphs in Trying Times"
1997 10 26. The Greenville News. "This Ballet Bites (Dracula)"
1997 11 1. The Greenville News. "Dracula ballet full of surprises"
1998 4 19. Tribune Review. 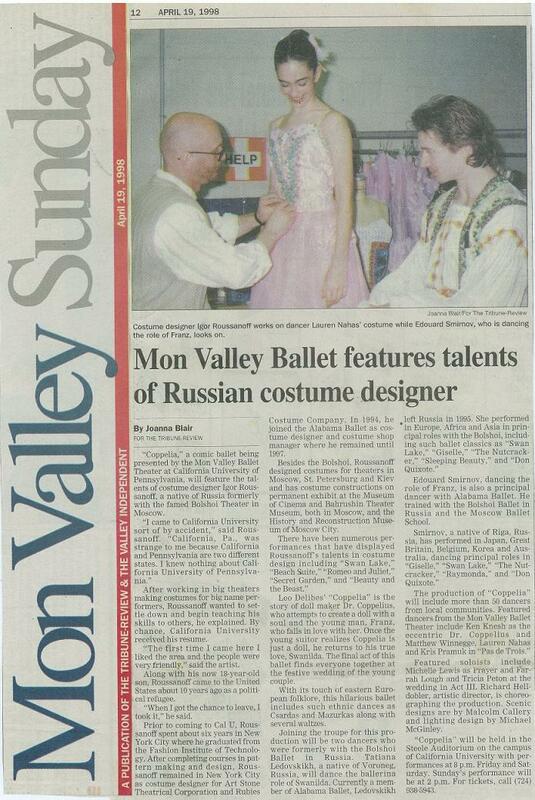 "Mon valley Ballet features talents of Russian Costume Designer"
1998 5 19. Valley Independent. 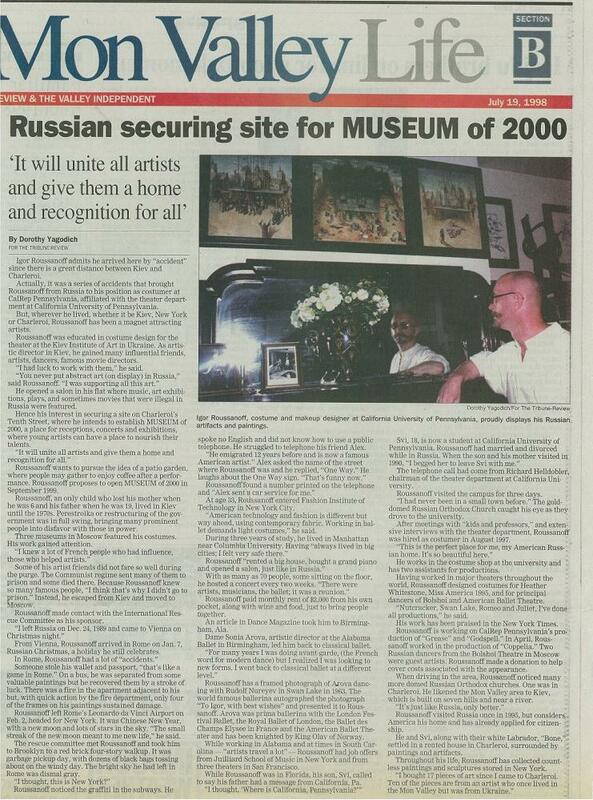 "Russian securing site for Museum of 2000"
1998 12 11. Herald Standard. "Nutcracker: A Living Production"
1998. Tribune Review. "Rent-to-buy agreement awaiting final approval"
1999 12 14. CalU. "Borislav Strulev, Hyung-Ki Joo to perform free concert"
2000 3 3. Herald Standard. 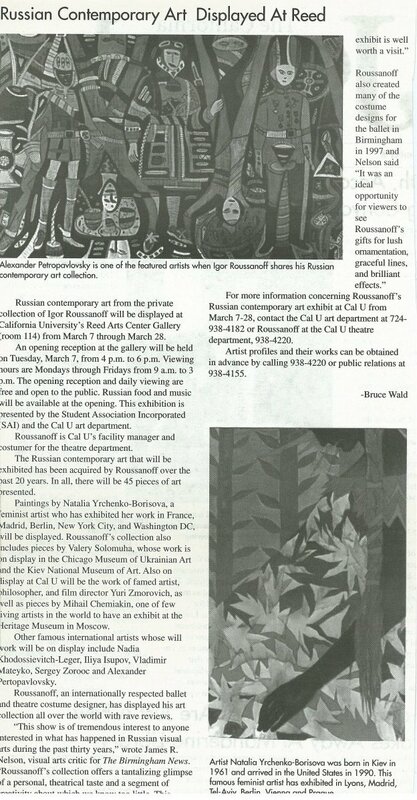 "College Gallery to Display Russian Art"
2000 3 6. Cal U Journal. 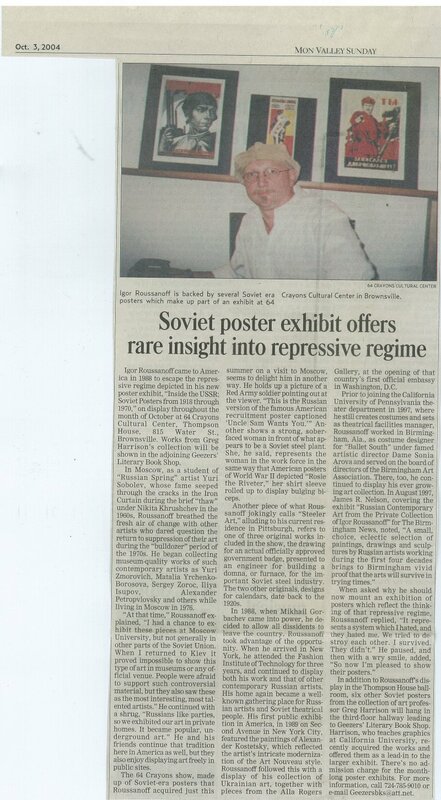 "Russian Contemporary Art Displayed at Reed"
2000 3 12. Pittsburgh Post-Gazette. "Sharing a rare collection of Russian Art"
2000 3 20. Cal U Journal. "Russian Contemporary Art"
2000 4 3. Cal U Journal. "Russian Art"
2000 8 25. Birmingham Post-Herald. "Exhibit at Birmingham Art Association"
2000 8 27. The Birmingham News. "Igor Roussanoff Costume Works for Dance and Theatre"
2000 11 3. Herald Standard. 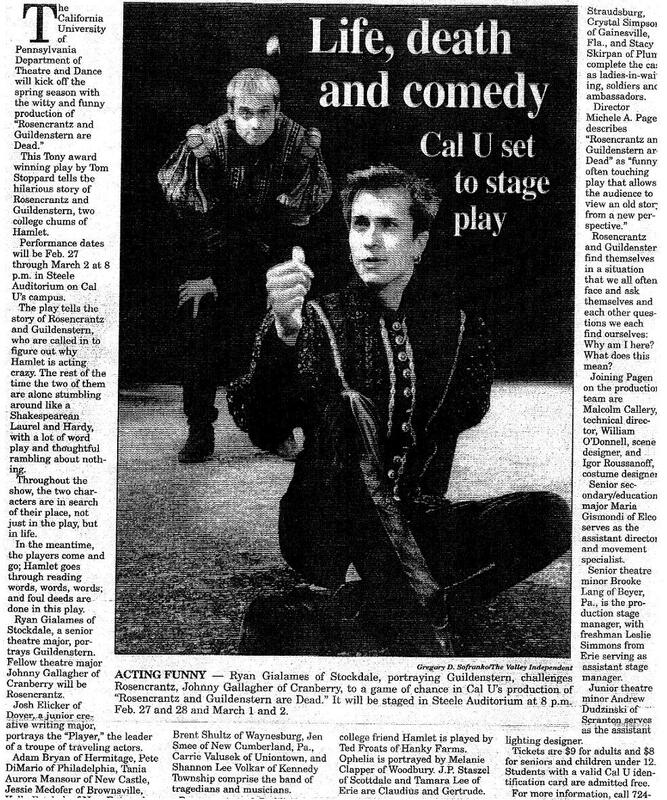 "'Dream Project' to become reality at Cal U"
2000 11 3. The Valley Independent. "Dream Project"
2000 11 6. Cal U Journal. 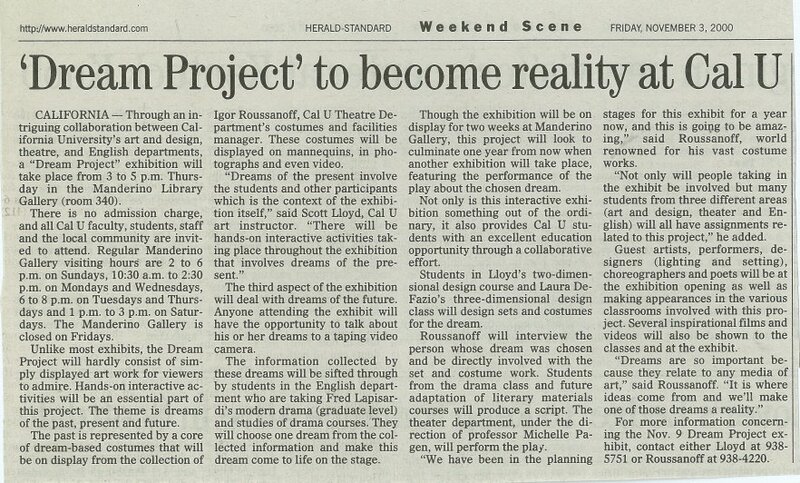 "Dream Project Exhibit at Manderino Gallery"
2000 11 19. The Observer=Reporter. "Dreamland"
2000 Nov. Attitude Dance Magazine, NYC. "Limon Institute Fall Concert"
2000 12 3. Herald Standard. 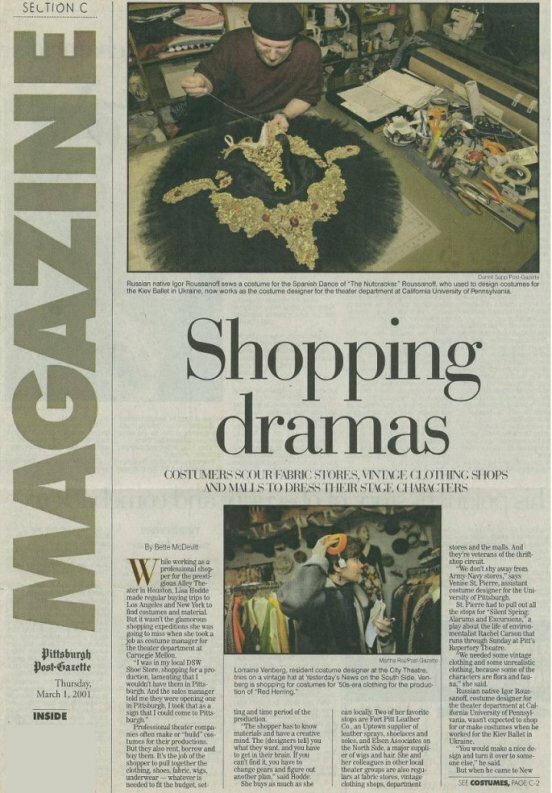 "Christmas Fantasy on Stage"
2001 Jan-Feb. Contrast-Pittsburgh's Art Forum. "Igor Roussanoff Russian Contemporary Art"
2001 4 29. Tribune-Review. 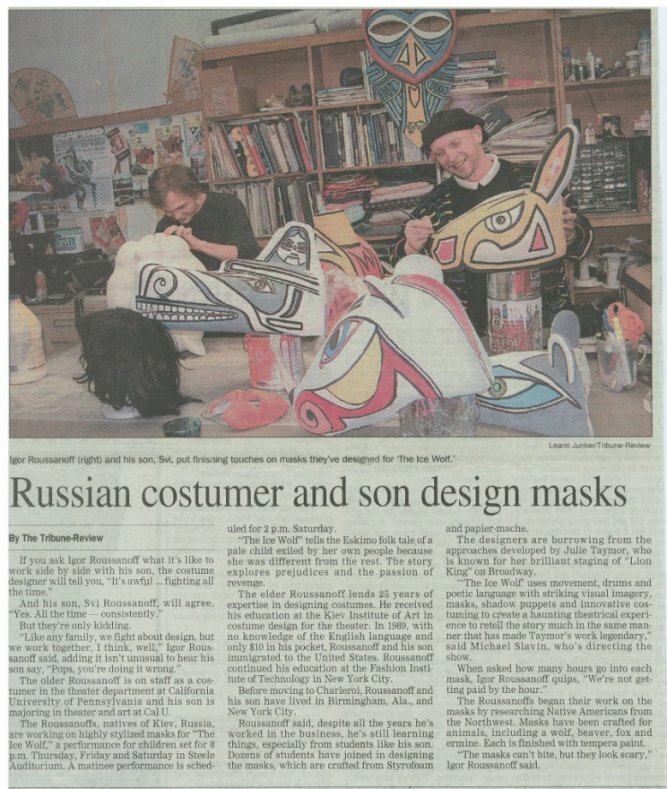 "Russian Costumer and Son Design Masks"
2001 9 19. Pittsburgh Post-Gazette. 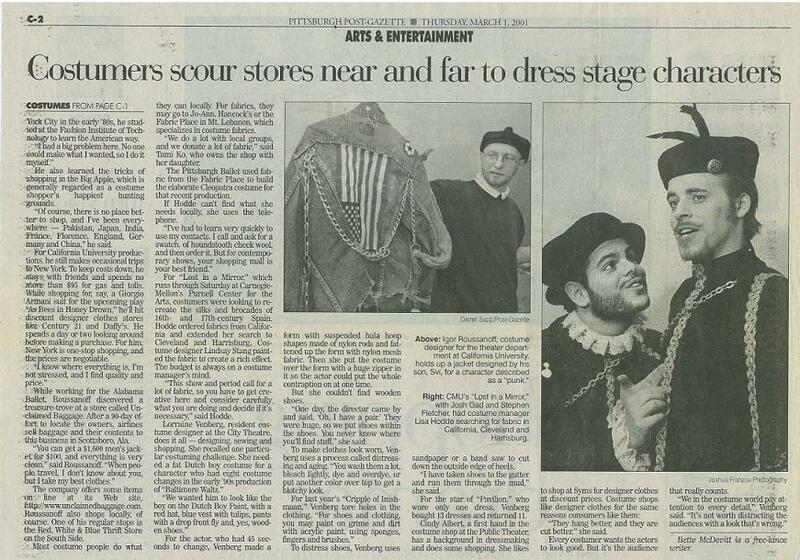 "Stage Review: Cuts keep 'King Lear' from its crowning glory"
2002 2 8. The Valley Independent. "Life, Death, and Comedy"
2002 3 25. Cal U Journal. "The Kiev Connection: A Story of Friendship"
2002 4. Dance Teacher Magazine. 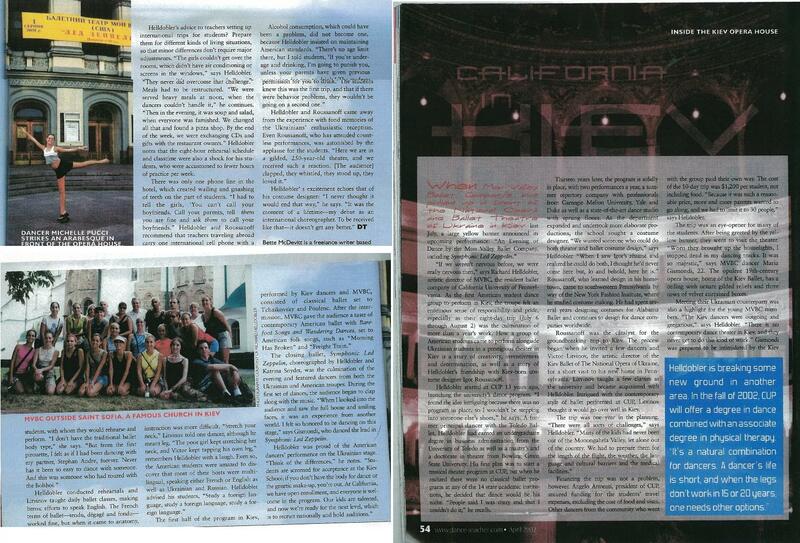 "California in Kiev"
2002 11 22. Cal Times. "Cal U Presents the Nutcracker"
2002 12 1. Tribune Review. 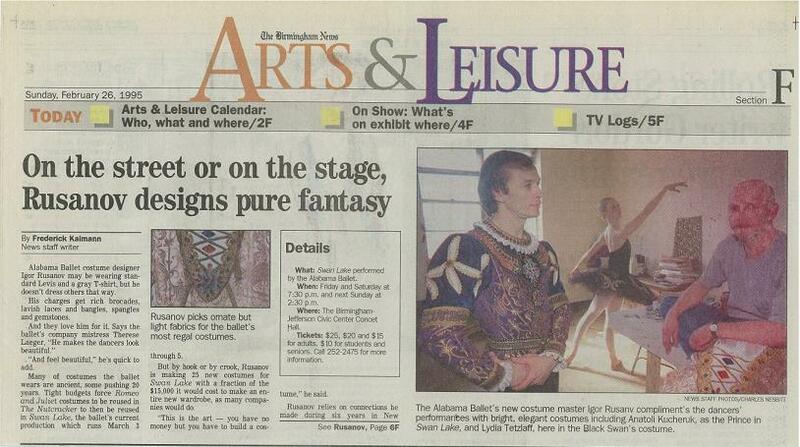 "Ballet Theatre to stage "The Nutcracker"
2003 4 13. Cal Times. "The Nutrcracker Performed at Cal U's Steele Auditorium"
2004 4 16. Cal Times. 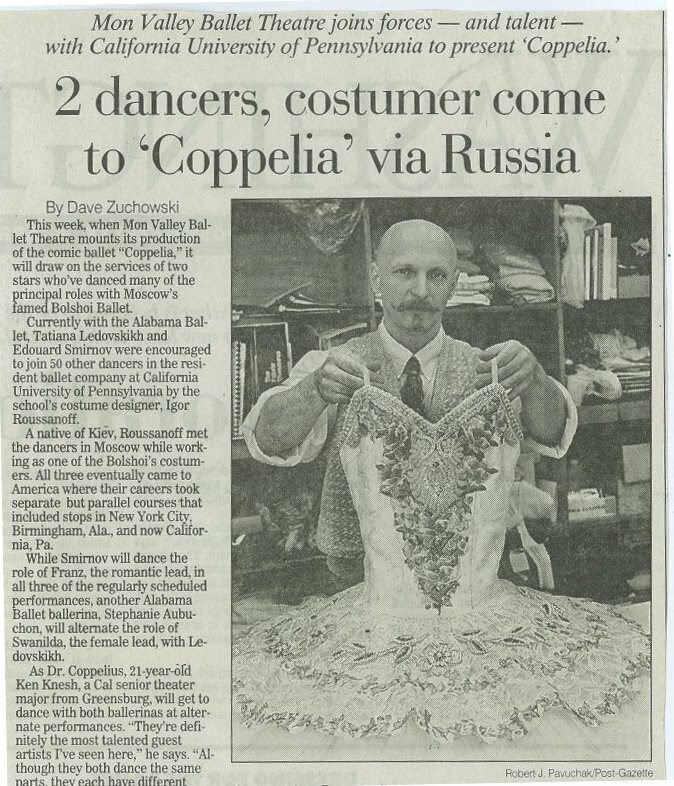 "Comic Ballet Coppelia at Steele Auditorium"
2004 4 26. Cal U Journal. "Comic Ballet Coppelia"
2004 9 17. Cal Times. "Professor takes pictures of cows in Czech Republic." 2005 10 28. Herald Standard. 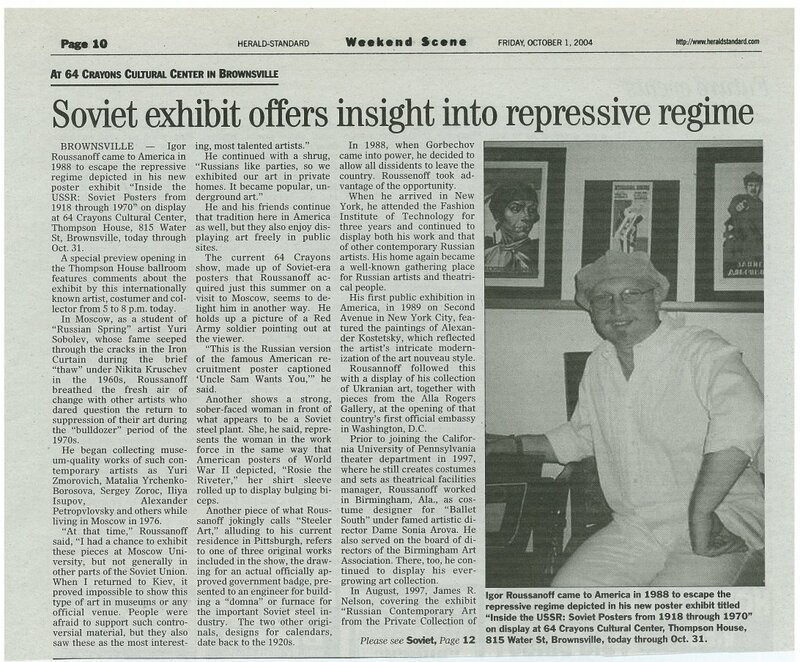 "'Revolutions' art exhibit opens at Jozart Studios"
2005 Winter. Cal U Review Magazine. "Outstanding Student Opera Presentation"
2005 11 4. Herald Standard. 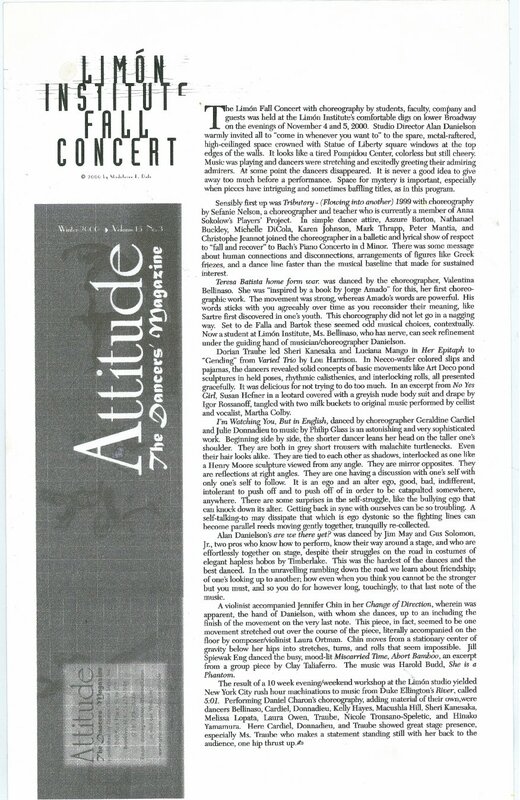 "Concerts to highlight exhibit"
2005 11 6. Tribune-Review. "Jozart Studio offers haven for artist"
2006 2 21. Cal U Journal. "Igor Roussanoff to Outfit Upcoming Exhibition"
2006 3 1. Pittsburgh Dish. "Quick Change Artists"
2006 3 6. Cal U Journal. 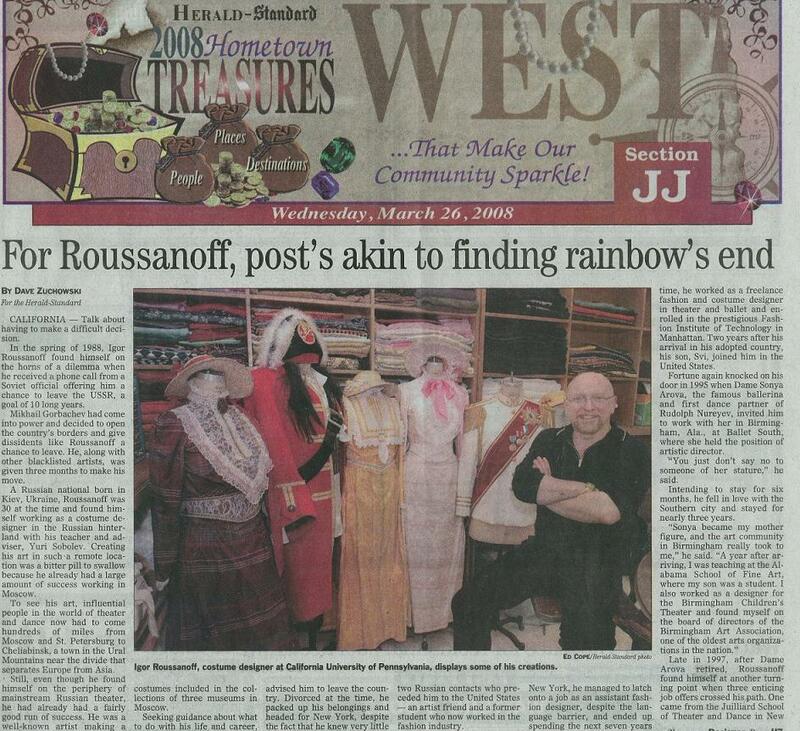 "Roussanoff to Outfit Upcoming Exhibition"
2006 4 6. City Paper (Pittsburgh). "On Screen Movie Reviews"
2006 4 11. City Paper. "The World's a Stage"
2006 September. Y Magazine. 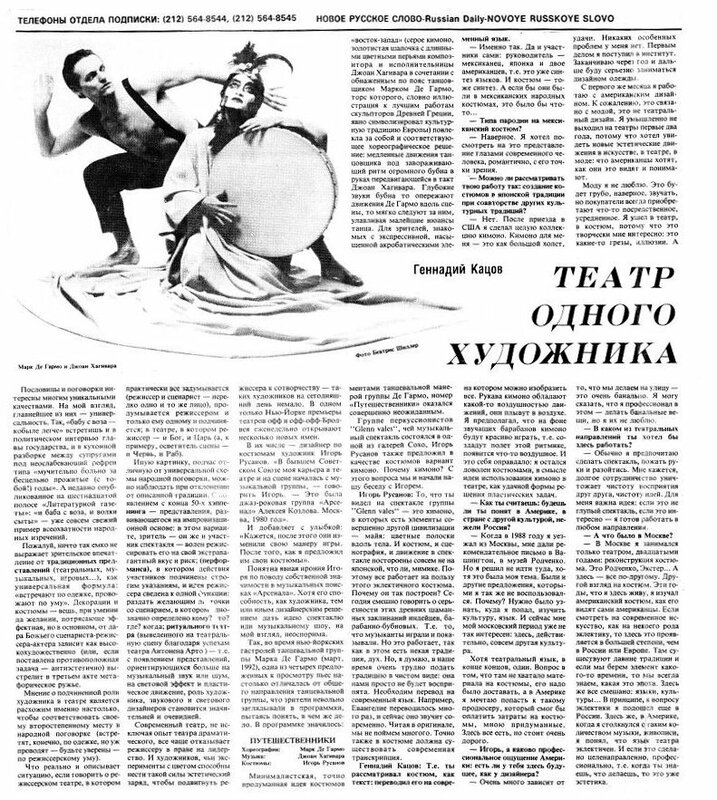 "Interview with Igor Roussanoff"
2006 11 25. Cal U Jounal. 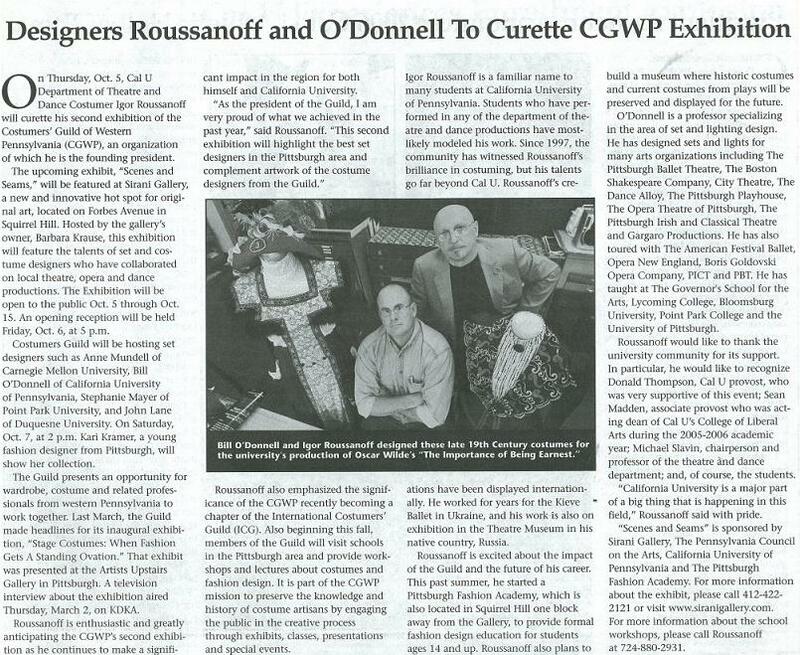 "Designers Roussanoff and O'Donnell to Curette Costumers Guild of Western Pennsylvania"
2006 10 4. City Paper. 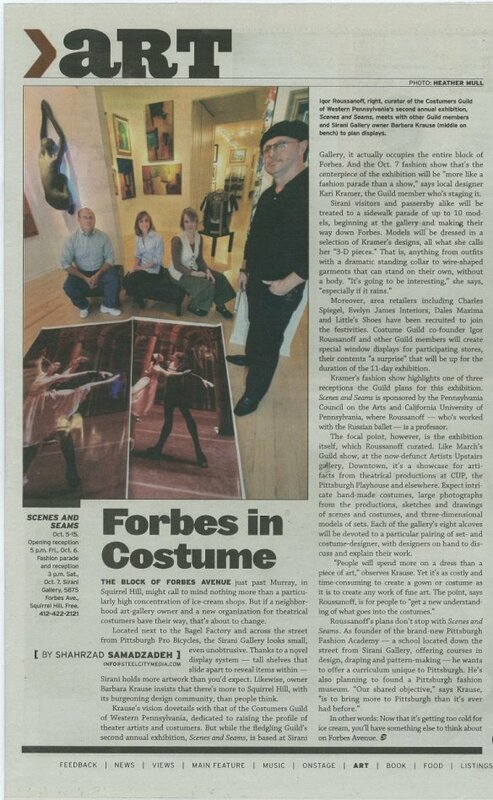 "Forbes in Costume"
2006 10 6. Pittsburgh Tribune-Review. "'Scenes and Seams' to showcase unforgettable scenes and sets"
2006 10 12. Pittsburgh Post Gazette. "Scenes and Seams"
2006 10 13. Tribune-Review. "Scenes and Seams Exhibit Reception"
2006 10 17. Post-Gazette. "Costumers Guild of Western Pennsylvania Exhibit"
2006 10 17. Post Gazette, On Stage Journal. 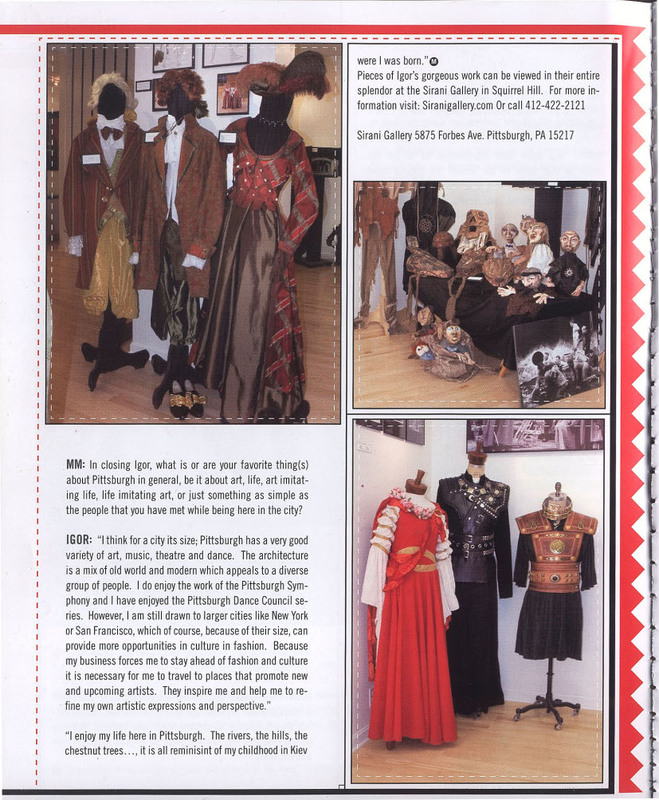 "Costumers Guild of Western Pennsylvania Exhibit"
2006 11 20. Cal U Times. 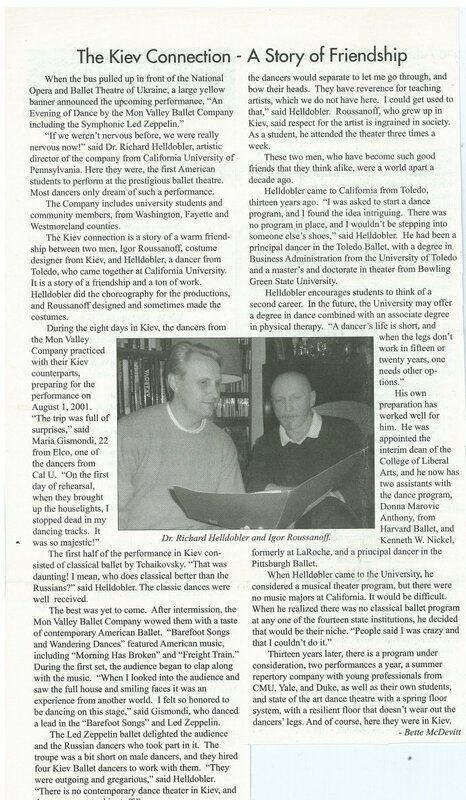 "Cal U to present The Nutcracker at the State Theatre"
2006 12 4. Cal U Journal. "Cal U to present The Nutracker in Uniontown"
2007 2 14. Post-Gazette. "PICT season plays with themes of Love and War"
2007 4 12. City Paper. 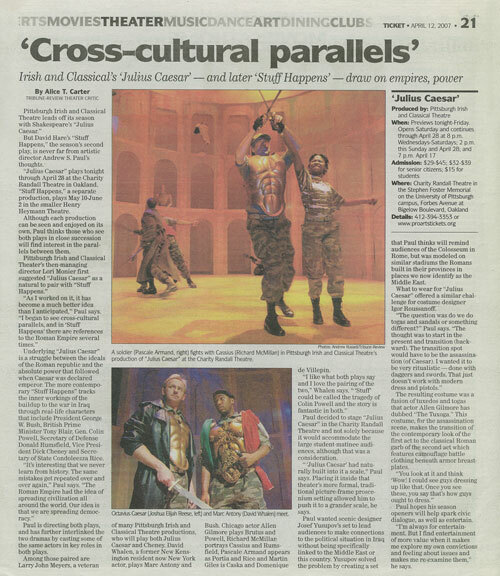 "Cross Cultural Parallels: Julius Caesar"
2007 4 12. Tribune-Review. "Cross-cultural Parallels"
2007 4 17. Tribune-Review. "Solid Performances Deliver Riveting 'Caesar'"
2007 4 18. Post-Gazette. "PICT praises 'Julius Caesar' on grand scale"
2007 12 3. Cal U Journal. "Cal U's Nutcracker tradition continues at The State Theatre"
2007 12 6. Tribune-Review. "Music: In his Prime"
2010. "Certificate of Merit: As You Like It"
2010 3 26. Russian Philadelphia. "As You Like It Article"
2010 3 20. Philadelphia News. 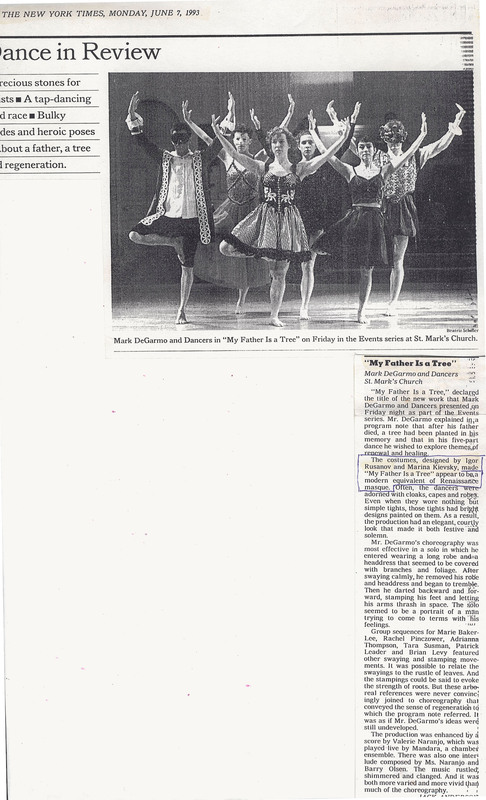 "Chasing the Legacy of Ballet Russe"
2010 9 18. Philadelphia News. "Memoirs of the Future"
2010 3 22. The Quad WCU. "As You Like It"
2010 3 29. The Quad WCU. "As You LIke It"
2011 3 24. Stage Newsletter. "The Misanthrope"